This ingenious commercial uses a seemingly extravagant feature: alligators. The objective of this ad was to convey how efficient and straightforward it was to use Apple’s technology. This was also one of the first commercials that Apple used to help promote its business back in the 1980s. This was a popular ad that Apple used to promote its new iMac when it first came out. They used a nifty three step system, showing how people connected to the internet through dial-up modems at that time. They wanted to convey that using Apple’s technology was much simpler to use since there was no need for “step 3”. 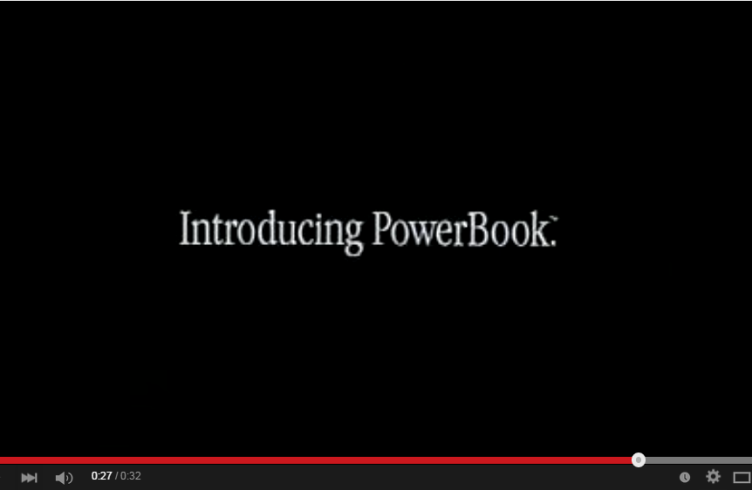 This was a great ad that Apple used in its promotion of its new powerbook, which was a great new innovation at that time. The setting of the majestic Grand Canyon also gives you an idea of just how far Apple really went to get a message across. They wanted their customers to know that they could feel free to “run away”, and still have Apple products available at their fingertips. Apple used this great and inspiring ad to help show people the wonderful benefits of live video feed on their computers. They wanted for people to understand that they were committed to removing barriers and making it possible for revolutionary ideas to be shared around the world instantly. This technology still prevails today in our use of great software such as Skype and FaceTime. This was a popular ad that showed various facets of not only the company but of the status of the United States at that time. By showing no favor to race in this ad, they are promoting racial equality in an understated way. Apple was also able to show how mass production of their products was beginning to make it possible for millions around the world to have access to their new products and technology, promoting a new age of technology for future generations. This is probably one of the first ads that directly plants Apple against Windows in what would be an unending rivalry. Apple wanted to use this particular commercial to show how easy it was to use their products versus books of codes to set up Windows and begin to even use the computer. They wanted people to know from the start that they cared about having user friendly software and technology available for their customers. Ellen Feis was a student who agreed to help Apple promote their computers through her own personal experience. Apple was able to then use this ad to help promote their products to a new market, namely the massive student market, as they were beginning to become more fluent with all of the new computers and technology available at that time. They knew that they needed an effective way of targeting this market so that their business would continue to flourish, and this was one of the ads that they used to do it. This was definitely one of the more comical ads that Apple put out. This was one of the ads that Apple used in its new line of “Think Different” ads in the 90s. It showed that Apple wanted to create a customer connection and definitely had a sense of humor. While it may be have been outside the box at that time, it did get people talking and it worked in their favor as it promoted their business by word-of-mouth. This was another of Apple’s ads that came out under their “Think Different” slogan. It showed the power that someone can have on the human race and used great examples in a very short period of time. They were able to portray world-renown figures such as Albert Einstein, Martin Luther King Jr, Mahatma Gandhi, and Jim Henson. This was a great ad that connected their true core values and visions to their audience in a meaningful way. It is very likely one of the most, if not the most, inspiring ad they have put out. In ending this amazing list of Apple Ads, we return to where it all started. This was their very first television ad that came out in 1984. They took a very unique approach and their take-away was for people to understand their intentions to revolutionize the world of technology, hence their line “you’ll see why 1984 won’t be like ‘1984’”. Apple has done a great job of promoting their products and staying on top of the times over the years in all of their ads. While it seems to be a by-gone era by now, it was only a mere 31 years ago when Apple promoted their first television ad and really started their quest to take over the market. When we look back, it is absolutely astonishing how fast technology has grown over these last 3 decades. We can only imagine what the future will hold for both amazing companies such as Apple and for all of us as consumers.